Ceybank Asset Management Limited is a leading Sri Lankan Asset Management Company, incorporated in 1991. The Company has the backing of four strong institutional shareholders namely Bank of Ceylon (44%), Sri Lanka Insurance Corporation (26%), Unit Trust of India (17.5%) and Carson Cumberbatch PLC (12.5%). Ceybank Asset Management Limited is involved in the following business activities. Ceybank Asset Management Limited has an in-depth insight into the working of the Capital markets and Money markets in Sri Lanka. The Company is involved in advising and structuring Unit Trust Funds and Investment Portfolios both in Equities and Fixed Income for clients to access the Sri Lankan Capital Market. Our Investment Philosophy is value oriented and Investment approach is research driven. We buy stocks where the management has a good track record in delivering performance and are fundamentally sound, at reasonable prices. In the case of fixed income securities, we always emphasize the need for capital preservation and will seek to maximize returns by managing the duration of the portfolios efficiently in relation to market interest movements. Ceybank Asset Management Limited is a socially responsible Company and invests in Investor education with the objective of creating a more knowledgeable investor. The Company representatives conduct workshops and training programs for School Teachers, Students and Investors country wide. These programs are conducted independently and also jointly with the Securities & Exchange Commission and the Colombo Stock Exchange. The premier state owned Commercial Bank with an Asset Base of LKR 1,200Bn which is 24% of the Sri Lanka’s total banking sector assets and with a deposit base of LKR 842Bn. Established in 1939 the bank has firmly entrenched as Sri Lanka’s premier financial services organization offering a broad range of services and holds the leadership position in its assets, deposits, and foreign currency remittances. The Bank boasts of a wide network of 567 Branches and 523 ATMs locally and 4 overseas branches in London, Male, Chennai and Seashells and 865 Correspondent Banks globally. The Bank was rated as the No 1 Brand in the country for the fifth consecutive year by Brand Finance Lanka in 2013 with a brand value of LKR 24Bn and is rated “AA (lka) / Stable Outlook” by Fitch Ratings, and ranked among the 1000 largest banks in the world. Established in 1962, the Sri Lanka Insurance is the largest and strongest composite insurance provider in Sri Lanka owned by the State, with an asset base of LKR 132Bn. The company also has the largest Life Fund in the insurance industry of LKR 60Bn and a strong capitalization of LKR 6Bn. With strong re-insurance arrangements, a highly experienced technical knowledge base and the widest network spread across the country, the company has over 52 years’ experience in fulfilling the insurance needs of the Sri Lankan people , honoring the largest claim ever paid of LKR 39.5Bn and the largest bonus ever declared to the life policy holders of LKR 4.2Bn. The company has been affirmed by Fitch Ratings at AA(lka) with Stable outlook and also AAA with Stable outlook from Lanka Rating Agencies. Carson Cumberbatch PLC is a diversified conglomerate incorporated in Sri Lanka with business interests spanning across South East Asian region. The core business interests of the group include Investment Holdings and Financial Services, Brewing, Oil Palm Plantations, with business interests in the Real Estate and Leisure Sectors. With an annual consolidated turnover of LKR 77Bn and assets over LKR 159Bn in both Sri Lanka and overseas, the Company accounts for nearly 3% of the total market capitalization of the Colombo Stock Exchange (CSE) and also the 7th largest listed company of the Colombo Bourse. One of the largest unit trust managers in India with over 30 years of experience in managing more than 100 unit schemes and over 9 Mn unit holders, and more than US$ 11Bn (INR 643.5Bn) assets under management. UTI Mutual Fund has a track record of managing a variety of schemes catering to the needs of every class of citizens across India. The management of Ceybank Asset Management Limited is vested in the Board, comprising eight Directors with rich experience and expertise in the financial sector in Sri Lanka and abroad. Mr. Palitha Pelpola is currently working as Presidential Coordinating Secretary at the Ministry of Defense. He is also a member of the Board of Hatton National Bank. Mr. Pelpola has served the Government of Sri Lanka in the capacities of the Private Secretary to the Minister of Mahaweli Development and Lands & Land Development. Managing Director of Mahaweli Economic Agency, Director of Mahaweli Centre, Special Advisor to the Minister of Plantation Industries and Director General of Mahaweli Authority of Sri Lank. He has also served as Secretary to the Leader of the Opposition when late Mr. Gamni Dissanayake held that position. He was the former Chief Executive Officer of Leader Publications Ltd and was the Media Consultant of World Health Organization. Mr. Palitha Pelpola was also the Senior Advisor of the Ministry of Enterprise Development & Investment Promotion and he has also worked as Executive Director of the Sri Lanka Foundation, Los Angeles, California, USA. Mr Sathkumara was appointed the Chief Executive Officer of Ceybank Asset Management Limited in June 2000. Prior to that, Mr. Sathkumara served as a Fund Manager for a period of 7 years having joined the firm in 1993. Currently, he is the Head of the Management Team involving formulation and implementation of investment strategies for the assets under management. Having commenced his career at The Finance PLC as a Management Trainee, he counts for over 25 years of experience in the financial services industry, holding key management positions in the Sales, Fund Management and Operations. Mr. Sathkumara holds a Bachelor of Science Degree from the University of Sri Jayewardenepura, Sri Lanka and a MBA in Finance from the Fordham University, USA. He has completed the Fund Managers’ course and participated in the investment Research Programme conducted by the UTI Institute of Capital Markets in India. Mr. Senarath Bandara appointed as the General Manager/ Chief Executive Officer in February 2018. Prior to this appoint he held the position of Deputy General Manager, in charge of Sales & Channel Management of Bank of Ceylon. Mr Bandara joined BOC in January 1990 as a Management Trainee and subsequently he was appointed to the corporate management in March 2012. He served in the Executive Management since January 2008 holding the position of Assistant General Manager in diverse business fields, viz. Overseas Branch Operations, International Banking, Corporate Relations and as the Chief Executive Officer of Bank of Ceylon (UK) Ltd. He is a career banker who has gained diverse experience locally and abroad mainly in the fields of information systems, investments, treasury management, international banking, corporate banking, development banking, Islamic banking, electronic banking, credit card operations, and branch operations. He successfully spearheaded the process of converting Bank of Ceylon operations in London from a branch to a subsidiary in 2010, in the process gaining knowledge of vital aspects of regulations and compliances in banking arena. He also gave the leadership to the bank- wide transformation project 'Wenesa' initiated with the Boston Consulting Group and also led several technology driven projects in the bank including the core banking system upgrade. Prior to joining the bank, he lectured mathematics for commerce students at University of Kelaniya and served at Mahaweli Authority as a statistician. He had been a resource person at the Institute of Bankers of Sri Lanka in the field of credit & investment management and currently serves as a member on the Governing Board representing BOC. He is also a nominee director of BOC to several companies including Merchant Bank of Sri Lanka PLC and Regional Development Bank. He is an active member of the Association of Professional Bankers (APB) of Sri Lanka and currently hold the position of Senior Vice President. Mr. Bandara obtained his first degree from the University of Kelaniya, Sri Lanka in the field of Physical Science and obtained an MBA from Postgraduate Institute of Management(PIM), University of Sri Jayewardenepura, Sri Lanka with a Merit Pass. He is also a Fellow member of Institute of Bankers of Sri Lanka (FIB) and obtained a Postgraduate Executive Diploma in Bank Management from the same institute with the highest ranking performanc award in 1998. Mr Fonseka was appointed as the Chief Financial Officer of the Bank from December 2016. He held the positions of Deputy General Manager (Finance & Planning) from April 2015 to December 2016 and Deputy General Manager (Retail Banking) from May 2013 to April 2015. Mr Fonseka has been a member of the Corporate Management of the Bank since 2012. Mr Fonseka started his banking carrier in branch operations and counts over 27 years of extensive experience in all aspect of commercial banking. He has specialized in financial management and strategic planning and implemented of an effective corporate planning process, budgetary control system etc., in Bank of Ceylon. He held a range of senior management positions including Budget & Strategic Planning, Retail Banking and Finance & Planning in Bank of Ceylon. He is a Non-Executive Chairman of the Board of Transitional Lanka Solutions (Pvt) Ltd and a Director of Lanka Securities (Pvt) Ltd and also of Property Development PLC. He serves as a Director of Merchant Bank of Sri Lanka & Finance PLC and MBSL Insurance Company (Pvt) Ltd. He is an alternate Director of LankaClear (Pvt) Ltd. Mr Fonseka also acts as the Chairman of the Audit Committees of Property Development PLC, Merchant Bank of Sri Lanka & Finance PLC and LankaClear (Pvt) Ltd. He holds a Special Degree in Business Administration from the University of Sri Jayewardenepura, Postgraduate Diploma in Management from Postgraduate Institute of Management and a Masters Degree in Business Administration from the University of Southern Queensland, Australia. He is a Fellow Member of the Institute of Chartered Accountants of Sri Lanka and an Associate Member of the Institute of Bankers of Sri Lanka. Mr. BabuRao has more than 26 years of experience in the area of Finance, Capital Markets and Fund Management in UTI Mutual Fund. During his career in UTI, he has handled various assignments and extensively worked in the areas of Project Finance, Investment Management, Offshore Funds, Venture Capital and Private Equity Funds, resolution of stressed assets and investor relations. Prior to joining UTI in the year 1989, he worked with Larsen & Toubro Ltd, for six years. BabuRao holds Bachelor Degree in Engineering and received MBA from Indian Institute of Management, Ahmedabad. Ajith Weeratunge is a Director of the Carson Cumberbatch Group’s Management Company, Carsons Management Services (Private) Limited and holds the position of Head of Finance. He is also a Director of Equity One PLC and Equity Two PLC, as well as the Group’s Investment Holding Sector - Ceylon Investment PLC, Rubber Investment Trust Limited and Guardian Fund Management Limited and the Leisure Sector - Equity Hotels Limited. He carries more than 34 years of finance related experience in the mercantile sector and has held positions in Lanka Walltile Ltd., Union Apparels (Pvt) Ltd., John Keells Holdings PLC, Phoenix Industries (Pvt) Ltd and Ceylon Beverage Holdings PLC. He is a Fellow member of the Chartered Institute of Management Accountants of UK. Mr Ruwan possesses over 15 year of hand –on experience in banking with special knowledge in Financial Management and Strategic Planning. He is a graduate of University of Sri Jayawardenapura , Sri Lanka with bachelor of Science (Special ) Degree in Accountancy and holds Master in business Administration from Open University of Sri Lanka. He is a Fellow Member of the Institute of Chartered Accountants of Sri Lanka, Associate Member of Certified Management Accountancy of Sri Lanka and also an Associate Member of Institute of Bankers of Sri Lanka. Mr Ruwan has been a member of Executive Management of the Bank since October 2016. He holds the position of Assistant General Manager – Investment Banking since May 2017. My Ruwan has been serving as a Director and as the Chairman of Audit Committee of the Grand Oriental Hotel from October 2016. Mr Kumara serves as Director on the Ceybank Holiday Homes Ltd too. He joined the Bank as a Management Trainee in 2002. Commence his career with retail banking and the specialized in Financial Management and Strategic Planning of the Bank, whilst acquiring wide experience in all aspects of commercial banking. He also serves in bank of Ceylon (UK) Ltd as Chief Operating Officer from April 2014 to April 2017. Prior to join the Bank of Ceylon, he worked in Capital Maharaja Organization for four and half years. An eminent panel of experts with in-depth experience in global business and finance supports the management by providing general guidance and direction on the economy and the capital market. Mr. Selvanathan is the Chairman of Bukit Darah PLC and Deputy Chairman of Carson Cumberbatch PLC and Goodhope Asia Holdings Ltd. He is the President Commissioner of the palm oil related companies in Indonesia. He holds Directorships in several subsidiary companies within the Carsons Group and is also a Director of Sri Krishna Corporation (Private) Limited, and the Chairman of Express Newspapers (Ceylon) Ltd. He is also the Chairman of Carsons Management Services (Private) Limited, and Agro Harapan Lestari (Private) Limited. He is a Past President of the National Chamber of Commerce and Past Vice Chairman of the International Chamber of Commerce (Sri Lanka). He counts over 20 years of experience in commodity trading in International Markets. He holds a Bachelor of Commerce Degree. Mr. Palihena is the former General Manager of Bank of Ceylon and is a former Director of DFCC Bank, has a distinguished banking career spanning almost 40 years. He presently serves as a Director for E.B. Creasy & Company PLC and some of its subsidiaries, The Colombo Fort Land & Building PLC, Softlogic Finance PLC, SMB Leasing PLC and in several companies of the Hirdaramani Group. Mr. Palihena is a Fellow of the Chartered Institute of Bankers – UK and a Fellow of the Institute of Bankers, Sri Lanka. He holds a Postgraduate Diploma in Business and Financial Administration from the Institute of Chartered Accountants of Sri Lanka. Our partnerships in the Trustee and Custodial Services are with reputed Financial Institutions. Presently the National Savings Bank (AAA lka), Sri Lanka’s premier State Owned Savings Bank is the Trustee and the Bank of Ceylon (AA+ lka) is the Custodian for all the Ceybank Unit Trust Portfolios managed by Ceybank Asset Management Limited. The Standard Charted Bank provides Custodial Services for some of the Private Portfolios managed by us. The Senior Members of the Fund Management Division consists of well-qualified experienced personnel involved in providing a proficient and ethical investment management service, backed by up-to-date investment research. The Fund Management Team has undergone in-depth on-the-job training in the field of investment management and trading operations with UTI. The Investment Division has been set-up and the senior managers have been trained in the necessary techniques and skills required for its operation under the supervision of a Fund Manager deputed from UTI under a Technical Assistance Agreement. Further, visiting expatriates from Unit Trust of India have trained the staff in specialized areas from time to time. Mr. Sathkumara is the Chief Executive Officer of Ceybank Asset Management Limited and heads of the management team involving formulation and implementation of investment strategies for the assets under management. Mr. Ferdinands joined the company in July 2008. Prior to joining Ceybank Asset Management Limited, he worked at National Asset Management Limited (NAMAL), managing fixed income Funds, the Primary dealer operations and Marketing functions, where he was instrumental in introducing new Funds, among them the first Money Market Fund and Shariah based unit trust Fund in Sri Lanka. He has also worked as a Foreign Exchange broker at Forbes Money Brokers prior to working at NAMAL. He is currently involved in managing the Fixed Income Funds of the company and structuring new unit trust Funds and Investment Plans. He is a Chartered Marketer (UK) and Certified e Marketing Associate (USA). He is presently reading for MBA (Finance) at University of Southern Queensland, Australia. Ms. Karannagoda is responsible for the execution of trades in the implementation of investment policies and trading strategies for the unit trust Funds and client portfolios. She also carries out the in-house research function for the Company. Having joined the firm in 2005, she counts over 9 years of experience in Investment research and Fund Management. Prior to joining Ceybank Asset Management Limited she served in the Investment Division of Union Assurance Ltd as an Investment Executive from 2004 - 2005. Ms. Karannagoda is an Associate Member of Chartered Institute of Management Accountants (CIMA-UK), and also a Chartered Global Management Accountant. She holds a Bachelor of Science in Business Administration (Finance) Special (Hons) degree from the University of Sri Jayewardenepura. Ms. Kavindya currently works as an Executive Investment at Ceybank Asset Management Limited. She is responsible for assisting the Fund Manager in managing fund Cash flows and executing daily investments. She also carries out in – house research functions for the company. Ms.Kavindya holds a Bachelor of Science in Management (Finance) special (Hons) degree with a Second Upper Class division from University of Sri Jayewardenepura, Sri Lanka and is part Qualified in Chartered Institute of Management Accountants (CIMA)UK. Mr. Elapata joined Ceybank Asset Management Limited in April 2015.He is responsible for caring out in house research functions. He also carries out execution of trade in the implementation of investments policies and trading strategies for Unit Trust funds. Prior to joining Ceybank he worked at Entrust Securities PLC (Primary Dealer) and Entrust Wealth Management limited as an Executive. He also worked at Capital Trust Securities as an Investment Analyst. He started his career at HSBC Sri Lanka corporate banking division. Mr. Elapata holds a Bachelor of Businesses Administration with Economics Degree from the University Of Greenwich UK London. He is also doing his Maters of Financial Economics MBA (MFE) at University of Colombo Sri Lanka. Mr. Buwaneka joined Ceybank Asset Management Limited in July 2014. Currently he works as an Executive Investment at Ceybank Asset Management Limited and prior to joining the Fund division he worked in the Finance division of Ceybank. He is responsible for assisting the Fund Manager in managing fund Cash flows and executing daily investments. He also carries out in – house research functions for the company. Mr. Buwaneka holds a Bachelor of Science in Management (Finance) special degree with a Class from University of Sri Jayewardenepura, Sri Lanka and he is partly qualified in CA Sri lanka and he is passed finalist of Certificate in Capital Market. He is currently reading for his Maters of Applied Finance MSc. (App.Fin) at University of Sri Jayewardenepura. Mr. Wimalaratne joined the company as the General Manager/ Compliance Officer in November 2010. He is responsible for the General Administration, HR and Compliance functions of the firm. Prior to joining Ceybank Asset Management Limited, he served at Bank of Ceylon for over 40 years in various capacities and retired as a Deputy General Manager. He is a Fellow member of the Institute of Bankers Sri Lanka and holds a diploma in Bank Management from the same Institute. He also holds a Postgraduate Diploma in Business & Finance Administration from the Institute of Chartered Accountants of Sri Lanka. Mr. Hettiarachchi is the head of the Accounts Division. He is responsible for all accounting functions of the Company, the Unit Trust funds and Client portfolios. He counts for over 15 years of experience with the firm, having joined in 2000. Prior to joining Ceybank Asset Management Ltd, he worked at Ernst & Young - Sri Lanka as a Senior Accountant. Mr. Hettiarachchi holds a MBA from University of Kelaniya and Bachelor of Science in Management Special (Hons) Degree from the University of Sri Jayewardenepura. He is also a Finalist of the Institute of Chartered Accountants of Sri Lanka (ICASL). Mr. Kekirideniya is the Head of the Marketing Division of Ceybank Asset Management Limited. Joined in 2008, he has over 20 Years of experience in sales and marketing both in FMCG and Financial Services in leading Sri Lankan companies. Mr. Kekirideniya is responsible for investment promotion, awareness building, advertising, management and development of sales channel and marketing of the Unit Trust Funds. He holds a Professional Diploma in Marketing from Chartered Institute of Marketing (UK) and an Associate Member of Institute of Commercial Management (UK). Ms. Pamudi Kariyawasam counts over 24 years of experience in Ceybank Asset Management Ltd in different capacities. Her experience in Finance Department is more than 23 years and appointed for the position as Acting Registrar in 2017. The Investment Committee which comprise of the Chairman and the Members of the Fund department headed by the Chief Executive Officer meets on a regular basis to oversee and provide direction on the overall asset allocation for the Unit Trust Funds and other Assets Under Management. The General Manager who oversees the compliance function of the company also sits in the Investment Committee in order to provide guidance on Compliance matters on Funds under management. The Compliance Officer ensures that the Unit Trust Funds comply with the statutory requirements demarcated under the Trust Deed, Explanatory Memorandum, Unit Trust Code and any other rulings directed by the Securities and Exchange Commission with regard to Unit Trusts. In addition he has to report to the Securities and Exchange Commission that the funds meet the said mentioned directions on a regular basis. Furthermore, the compliance officer monitors the portfolio transitions to prevent inter-portfolio transactions taking place and to ensure fiduciary duties and responsibilities of the manager are fulfilled. 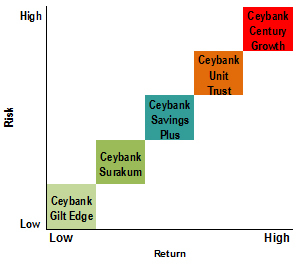 Ceybank Asset Management Limited uses the extensive branch network of its parent Bank of Ceylon as the principle marketing channel to promote Ceybank Unit Trust Funds. At present the company has regional offices in key metropolitan areas in Sri Lanka in addition to Bank of Ceylon branch network. With an increased representation of the Bank of Ceylon in the Ceybank Asset Management Limited, the company continues to utilize the Bank of Ceylon branch network more extensively in promoting Ceybank Unit Trust Funds. Additionally this would help the company to explore more synergies in operations with the Bank of Ceylon in the future which is expected to enhance the Bank of Ceylon’s initiative to take the Sri Lankan capital markets to the masses. Ceybank Asset Management Limited is regulated by the Securities & Exchange Commission of Sri Lanka (SEC) and is licensed to manage the following Unit Trust Funds. It is also licensed by the SEC to manage client portfolios and is registered with the Securities and Exchange Commission of Sri Lanka as an Investment Manager. The Unit Trust Fund mix offered by the Ceybank Asset Management Limited provides varied risk return profiles for investors seeking to enter the financial markets.